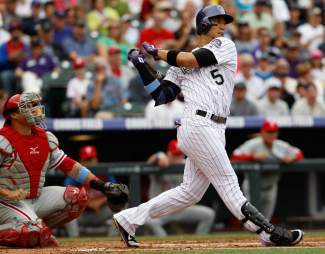 DENVER — Jhoulys Chacin came within an out of his second career shutout and the Colorado Rockies beat the Philadelphia Phillies 5-2 Sunday. Chacin gave up six hits, struck out three and didn’t walk a batter. His 8 2-3 innings marked the longest outing by a Colorado starter this season. Jimmy Rollins hit an RBI double with two outs in the Phillies’ ninth and Ryan Howard followed with a single, finishing Chacin (5-3). Rex Brothers got the final out for his second save of the season. Wilin Rosario and Carlos Gonzalez homered for Colorado. The teams combined for 30 runs and 55 hits in splitting the first two games of the series, but pitchers dominated the finale at Coors Field. Phillies starter Cole Hamels (2-10) was sharp early, but Chacin was efficient throughout. Chacin needed just 74 pitches — 59 strikes — to get through the first eight innings and he only had one three-ball count, to Rollins in the fourth inning. Chacin retired 14 in a row after Dominic Brown’s one-out single in the second. Kevin Frandsen led off the seventh with a single but was wiped out on a double play. Howard followed with a single up the middle against the shift, but Brown grounded out to end the inning. Chacin looked as if he was going to go the distance entering the ninth. He gave up a one-out single to Ben Revere, and he scored when Rollins’ drive to the wall was just over the head of right fielder Michael Cuddyer. After Howard hit an RBI single, manager Walt Weiss went to remove Chacin to a chorus of boos from the 45,186 fans who were hoping to see the first complete game by Rockies’ starter in two seasons. Hamels has lost two straight decisions and eight of his last nine. His only mistake was leaving a 91 mph fastball up to Rosario, who lined it into the left-field seats on the first pitch of the bottom of the second. It was Rosario’s 11th home run of the season. Hamels matched Chacin for the next four innings, retiring 12 in a row until Gonzalez led off the seventh with an infield single and Cuddyer blooped a double down the right field line. The Rockies cashed in both runners on Jordan Pacheco’s groundout and Nolan Arenado’s double to make it 3-0. Hamels allowed three runs on six hits, walked two and struck out seven. Gonzalez hit a two-run homer off reliever Justin De Fratus in the eighth to make it 5-0. NOTES: Cuddyer finished with two hits to extended his hitting streak to 14 games. It’s the longest of his career and the longest by a Colorado player this season. … The Rockies selected the contract RHP of Logan Kensing from Triple-A Colorado Springs and optioned RHP Chris Volstad. … Phillies C Carlos Ruiz (right hamstring strain) went 0 for 2 in his first rehab start with Triple-A Lehigh on Saturday. … Rockies OF Dexter Fowler returned to the lineup after sitting out Saturday. Fowler had not started since being hit on the right hand by a pitch Thursday. … RHP John Lannan (0-1) is expected to be activated from the 15-day DL Monday to start the series opener against Washington. … Rockies LHP Jorge De La Rosa (7-4) will open Colorado’s nine-game road trip in Toronto on Monday.